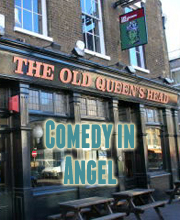 The Irish comic’s Fringe hour sees him tell a tail of inheriting a broken-down, unreliable, older-than-he-is motorcycle. Hello, I’m great thanks. I literally just got a delayed flight refund from The Dark Lords of Ryanair so it’s given me a bit of faith in the world! My show blurb and content are fairly on par but there’s some added stuff in the show that I think will really surprise the audience (in a good way). In a subtle way, maybe. They’ve definitely affected me but I’m not sure they’ve merged into my act, I try to steer clear of the topics that dominate our social media feeds and media because I think people are a bit overwhelmed and sick of them! I’ll be sharing with my fellow Irish comedy wife Rory O’ Hanlon. We help each other through the month; he doesn’t drink which makes it easier for me not to drink during the Fringe and we even go running together sometimes. Two Irish sober comics running through Edinburgh – only at the Fringe would you see such a thing! I’m looking forward to seeing new circus show Kin and sketch masters Foil, Arms and Hog who have been absolutely killing it the past year. And I’m really excited to see loads of brilliant stand up shows that I love and have been lucky enough to work with over the past few years! Well, I’m driving a battered old motorcycle over from Ireland this year as part of my show so if I survive that I’ll be very happy! Probably Bowie. I’ve been a huge fan for as long as I can remember – I think Labyrinth was one of the first movies I ever saw as a kid. Bowie had me as a huge fan then and his music had me soon after! I’d love any of you Fringe-going readers of this to come see my new show in August, it’s cost me real blood, sweat and broken gears! If you like real-life, funny, anecdotal stand-up and a show that’s full of surprises then my show is definitely for you, you won’t be disappointed!